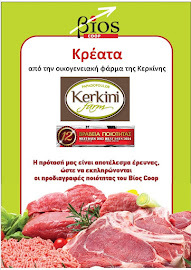 The purpose of “Βίος Coop” is the creation of a cooperative super market with high-quality and affordable products which will primarily come from agricultural cooperatives but also from independent producers. The quality is ensured by the selection of primarily pesticide-free and the exclusion of genetically modified products. Thus, we hope to strengthen the long-term production of organic products. The low price will be guaranteed by bypassing intermediaries - the products on the shelves are coming from the direct relations and collaboration with producers. The above two goals in combination with the ‘cooperative’ as well as the ‘non-profit’ nature of the super market which will be entirely owned by its members, render “Βίος Coop” a promising and extremely important new venture. Taking control of our food which has deteriorated in quality for the sake of profit is one of the first steps that need to be taken by truly active citizens. The General Assembly of the members is the supreme body of “Βίος Coop” which has the power to make decisions on any matter relating to the Cooperative. Participation is a key priority for the functioning and decision making of the assembly. Active members are the basis of this venture. Its structure and operation is based on international cooperative values and key principles, including “one person – one vote” whereby all members have an equal voice in setting policies irrespective of their cooperative shares. The management and control of the Cooperative is in the power of its members. The Board of Directors and the Supervisory Council are voted in and controlled by the General Assembly. Members and employees are continuously training on the cooperative principles and the values of the Social and Solidarity Economy. We operate openly and democratically; we provide training for our members and employees and we keep under control our elected bodies constantly. 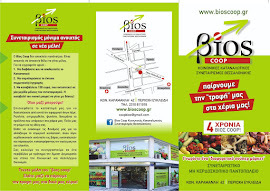 The Cooperative will collaborate with “Elliniki Diatrofi Coop” (a cooperative food supply company that has been established by agricultural and grocers cooperatives across Greece) for the supply of products that are produced by participating agricultural cooperatives as well as small production units. The Cooperative will also provide space on the shelves to the products of other cooperatives and independent producers in order to support and strengthen their effort. The products will be of better quality and lower price by eliminating intermediaries and the expensive shelves of multinational or indigenous chains of supermarkets. 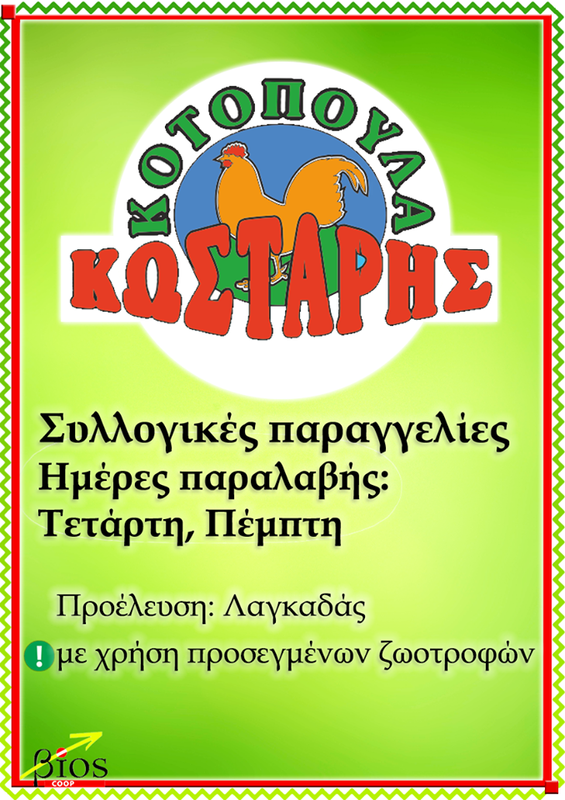 The Social Consumer Cooperative of Thessaloniki “Βίος Coop” was founded in 2012 with the initiative of PRO.S.K.AL.O. 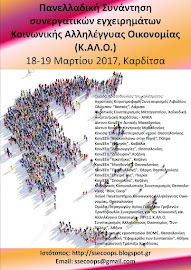 (Cooperation Initiative for the Social and Solidarity Economy, www.proskalo.net). 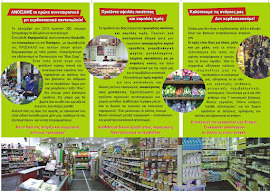 Subsequently, a wider group was developed with the purpose of creating a cooperative supermarket in Thessaloniki. New members’ registration is still open as the capital raised for the creation of the supermarket comes directly from the shares of the members, who will also be partners-owners. According to our business plan, apart from the lower cost and higher quality food, we also emphasise on the reinvestment of Βίος Coop’s profits to its members and the local community, as defined in the Articles of Incorporation and shaped by decisions of the General Assembly. 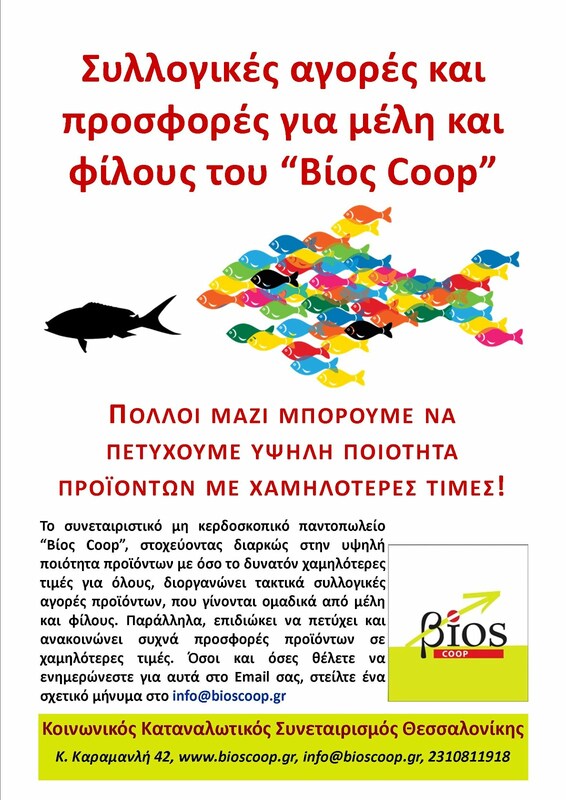 Our immediate goal is to reach around 600 shares of €150, in order to open shortly the first store of “Bios Coop” in Thessaloniki. 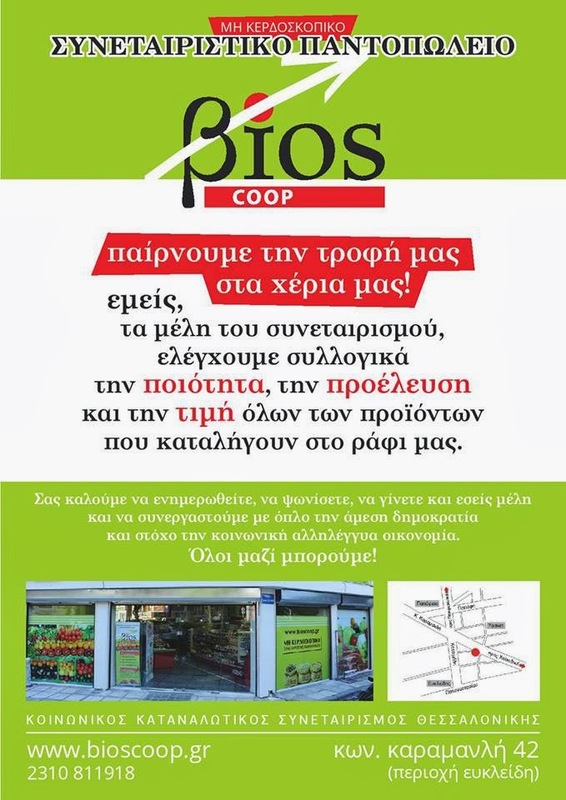 The cooperative grocery “Βίος Coop” will operate based on the views, values and principles of the Social and Solidarity Economy and democratic member control. By supplying primarily local and indigenous products and services which are of high-quality and low prices, the Cooperative aims to contribute to the development and modernisation of the production process. In addition, it aims to cover the needs of its members and other citizens in terms of fair-trade products and services which have low prices for the consumer while being fair for producers. For the above you need to get in contact with a member of the temporary board of directors of the cooperative.